Amazing Origami Kit is designed for origami paper folders of all ages and all skill levels--from novices up to more experienced folders. 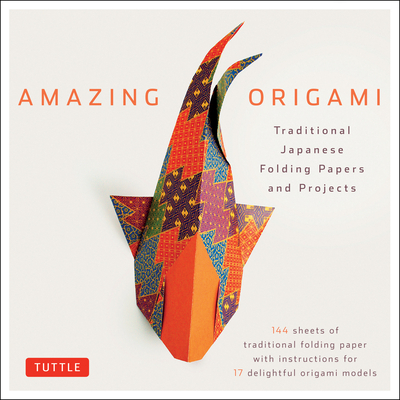 It provides everything you need to create exciting and original origami art. The gorgeous folding papers feature delicate patterns with gold detailing, recalling the one-of-a-kind traditional designs used in the Japanese kimono fabrics from a bygone era. One of the pleasing aspects of origami is its simplicity. The paper folder needs nothing more than something to fold--no glue, no tape, no string or wire--just a piece of paper Though the materials are simple, origami exemplifies the ability of the human mind to solve problems and create a beautiful harmony. Origami is relaxing and peaceful, but it is also fun and exciting to discover new ways to fold paper. With Amazing Origami's simple instructions, origami beginners will be able to get started immediately. With the beautiful, Japanese origami paper, experienced paper folders can create unique origami art.